(BPA) Answer the following questions with reference to the figure below. How many of these DNA preparations contain more than one frequency class of sequences? Explain your answer. 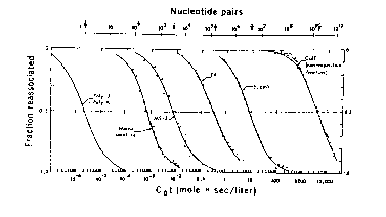 If the genome size of E. coliis taken to be 4.5 x 106 nucleotide pairs, what is the genome size of T4? What is the complexity of mouse satellite DNA? Mouse satellite DNA represents 10% of the mouse genome. What is the repetition number for mouse satellite sequences, given that the haploid genome size is 3.2 x 109 nucleotide pairs? The calf genome is the same size as the mouse genome. What fraction of the calf genome is composed of unique sequences? Use the information provided to calculate the Cot1/2(pure), the complexity (N), and the repetition frequency (R) for each component. Assume that the slowly renaturing component is single copy. Calculate the genome size (G) of the armadillo under the assumption that the slowly renaturing component is single copy. Which of the following sequences could be a member of the fast renaturing component?